As I wrote you sometime ago, I had very much hoped to be present at the Red Cloud3 commencement exercises this year. I had made all my plans to go west about the first of May, and uhntil a few days ago, confidently expected to be at home by the time the school year closed. Within the last two or three days, however, I have seen that instead of turning westward I must face in the opposite direction, and that very soon. I am sailing immediately for London4 to attend to some business matters5 there. Since you asked me to go on the commencement program, I had expected to get something ready for you on my way west, but my hurried departure will not leave me time to= prepare any sort of paper to send you. I would be glad to write something on the way over and send it back to you, but the time would be so short that in all probability anything mailed from England6 would not reach you before the 19th. Let me thank you for the invitation and ask you to express to the Board of Education my regret at being unable to accept it. Since I cannot be present, therefore, I will ask you to let this letter represent me, if you see fit7. I have been interested in the Red Cloud schools for many years, and have kept in touch with them through so many brothers8 and sisters9, that to think about them and wish them well has become a mental habit. I could not forget the schools if I tried; they play a part in many of my happiest memories, and some of my truest friends have been closely connected with them. If I had no other reason to love the schools of my own town--and I have many others--I should always love them because of Mr.10 and Mrs. A. K. Goudy11 and Mr.12 and Mrs. O. C. Case13. When my father14 first moved into Red Cloud from his ranch, and I was taken to the old high school building to be entered as a pupil in the Red Cloud schools15, Mrs. Case--then Miss King--was principal, add she was the first person who interviewed the new county pupil. She had a talk with me up in the old bell room. I remember her well as a stalwart young woman with a great deal of mirth in her eyes and avery sympathetic, kinsd cvoixce. 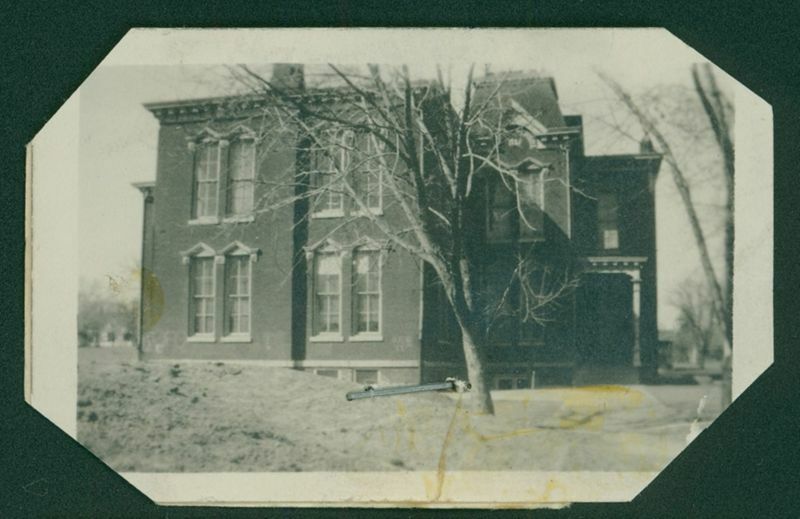 I was placed in a class in Miss Gertrude Sherer’s16 room. I do not remember much about what went on during my first day in school, but that afternoon I brought away three distinct impressions that Trix Miaer17 was the prettiest little girl I had ever seen, that Margie Miner18 was so jolly I wanted awefully to know her, and that eddie Emigh19 never looked at his book because he was always looking at Trix. The next year Miss King was made principal of the South Ward School,20 and I was a pupil in her A. grade. I am very sure that Miss King was the first person whom I ever cared a great deal for outside of my own family. I had been in her class only a few weeks when I wanted more than any thing else in the world to please her. During the rest of that year, when I succeeded in pleasing her I was quite happy; when I failed to please her there was only one thing I cared about and that was to try again and make her forget my mistakes. I have always looked back on that year as one of the happiest I ever spent. After I left Miss King’s room she became County Cuperintendent. As I went on through the high school she always helped and advised me; she even tried very hard to teach me algebra at night, but not even Miss King--who could do almost anything--could do that. After I went away to the State University there came a year or two when I was so taken up with new things and people, and so much excited about my work in Lincoln21, that I saw comparatively little of my old friends. Just before I went away to school Miss King had married Mr. Case and when I began to see a good deal of my old friends again, I learned to care for Mr. Case almost as much as for his wife. I believe I am not the only graduate of the Red Cloud schools whose courage Mr. and Mrs. Case revived time and again. I believe that all the boys and girls whom they helped will agree with me that one of the things best worth while in life is to keep faith with those two friends of ours who gave us their confidence. In the lon summer evenings Mr. Case and his wife used to sit on the front porch22 behind the vines and the little maple trees and plan out useful and honorable futures for the Red Cloud boys and girls. There is nothing for us to do now but to try to realize those generous dreams of theirs. I can scarcely realize that it has been nineteen years since I stood on the stage in the Red Cloud opera house with two little boys--if I remember rightly we all three looked like little boys23--and made my Commencement speech24. Let me warn the graduates of 1909 that the next nineteen years will go so quickly that they won’t have time to turh around in them. Tne thing I best remember about my own graduation is the class tree. It was a little crooked-backed locust honey locust that Alec Bentley25 and John Tulleys26 dug out of a row of locusts on my Grandmother27 Cather’s land. I don’t know why I was more Interested in the tree than in anything else about graduating, but I was. My brothers28 and I carried water from the High School pump and watered it ever so many times that summer/ The tree wilted and peaked and pined and languished all summer. But look out for what it would do next summer, we thought. But next summer it was no better, nor yet the next. The thing simply would not grow. For years it seemed to stand still. For that matter the matter of that we all stood still; john didn’t grow, and Alec didn’t grow. But the tree, at least was getting ready to grow. I went home one summer to find that after having been a crooked bush for years and years it had really shot up to a considerable height. The tree stands in the south east corner of the High School yard, and I hope the Red Cloud boys and girls will be good to it. I hope none of your graduates tonight are as much frightened as I was when I got up to deliver my important oration. When Mr. Goudy read my name and I rose and went to the front of the platform, the room looked as if it were full of smoke and the people seemed to have run together. I looked at this blur and made out three faces looking intently at me. Mr. Henry Cook29 in the front part of the house, and further back Mr. William Ducker30 and Mrs. Case. These three friendly faces gave me courage, and I am sure they always will. Document is two leaves, typewritten on recto of each leaf. Document is a transcript. 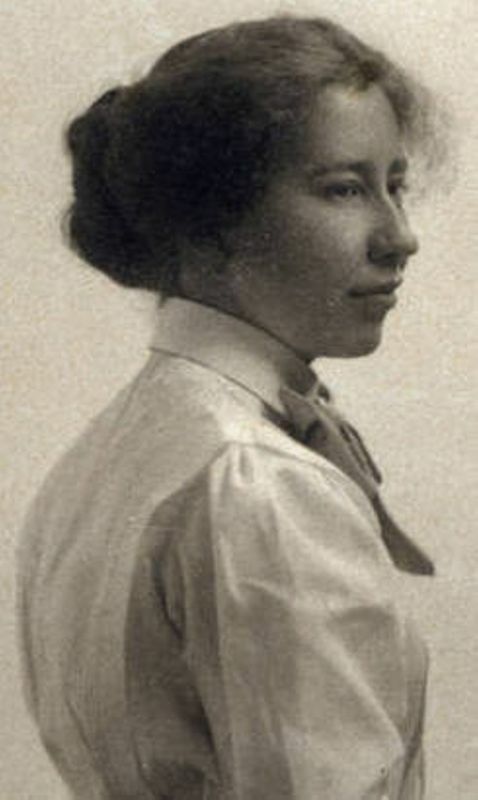 S. S. McClure sent Cather to London in May 1909 on a scouting trip for new writers. She returned to New York on 13 July 1909. 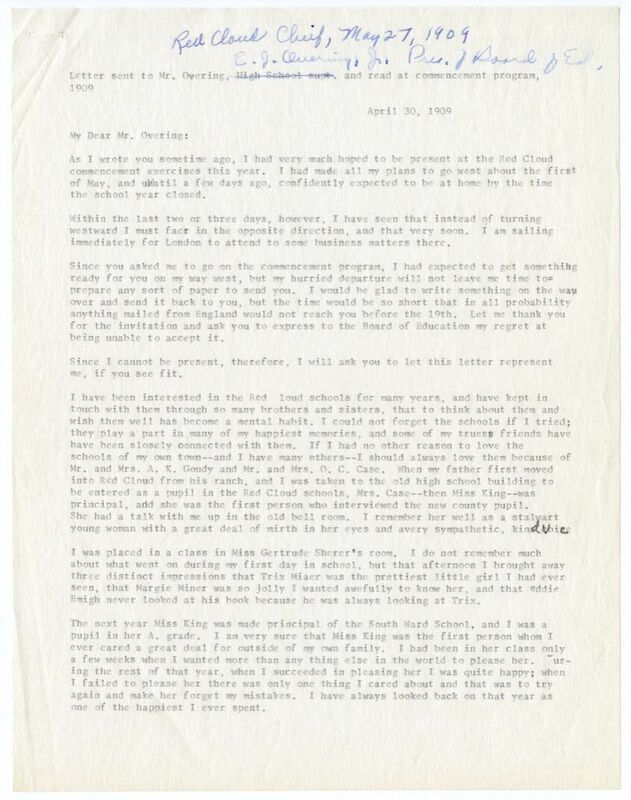 According to the Red Cloud Chief, Dora Kaley read this letter at the Red Cloud High School Commencement on 20 May 1909. 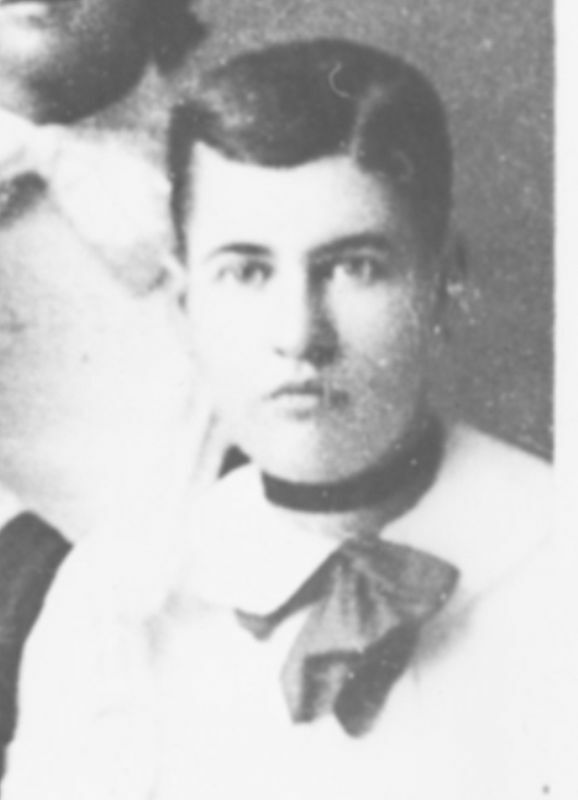 Willa Cather attended grammar school and high school in Red Cloud from 1885 until 1890, when she gave the commencement address at her graduation from Red Cloud High School in June of that year. 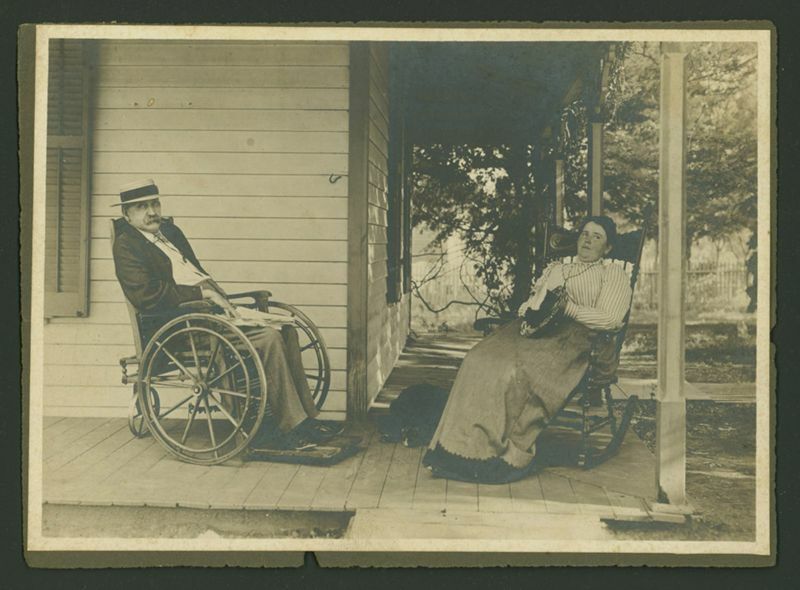 Oliver Case and Eva King Case on the porch of their home at 742 N. Seward Street in Red Cloud, NE. 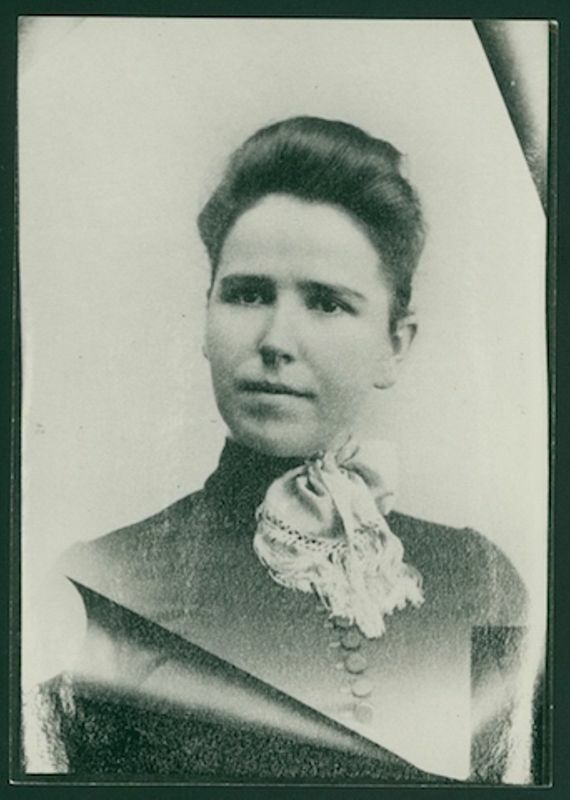 Cather delivered "Superstition v. Investigation" at her commencement in June 1890, which can be found in Bohlke's Willa Cather in Person: Interviews, Speeches, and Letters. Overing, E. J. (1874-1952). Red Cloud businessman. 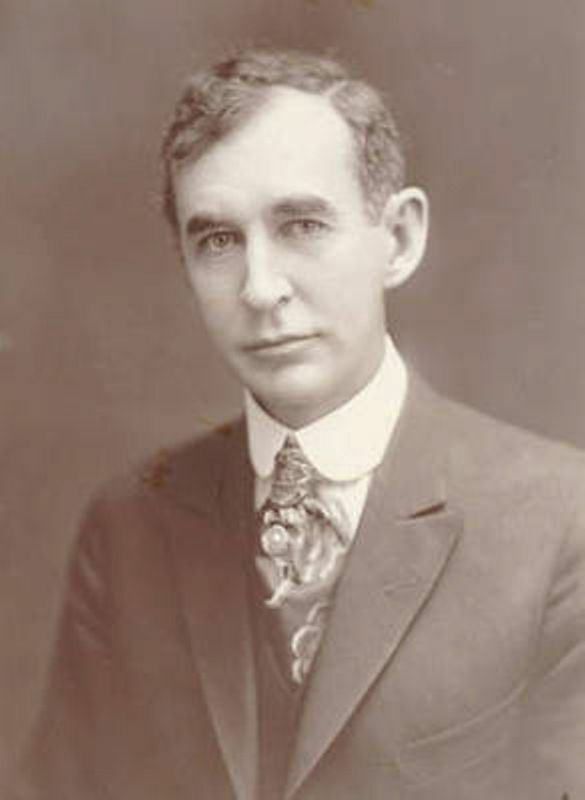 Edwin James Overing was born in Massachusetts. In 1896 he and his elder brother George opened a marble and monument business in Red Cloud, NE. He married Johanna Van Pilsum about 1902; they had three children. 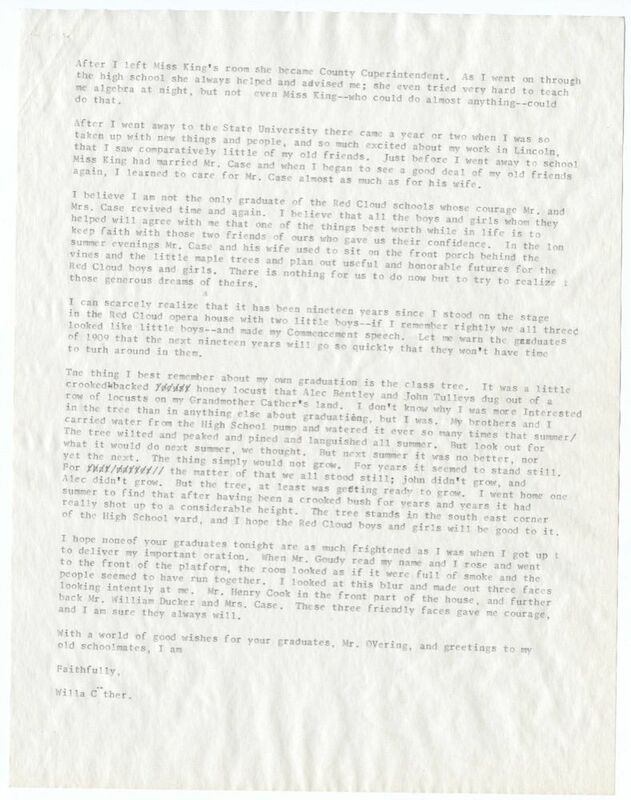 As president of Red Cloud’s board of education, he invited Willa Cather to speak at the high school graduation ceremonies in May 1909. Sherer, Gertrude (1865-1938). Red Cloud teacher. Born in Ohio, Gertrude and her siblings moved with their parents, R. R. and Elvira Sherer, to Red Cloud, NE, by 1875. In failing health, her father sold his drug store in 1885, and Gertrude and her younger sister Cordelia both became schoolteachers. In 1891, Gertrude married Frederick A. Knight of Minneapolis, MN, and lived there until her death. 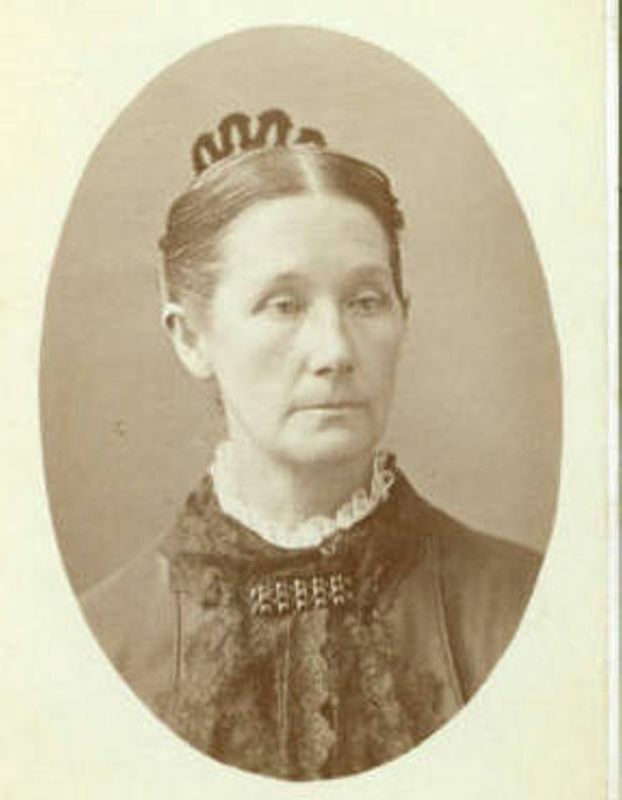 She was Cather’s first teacher in the Red Cloud school. Florance, Beatrix Elizabeth Mizer (1875-1963) (“Trixie,” “Trix”). Cather’s childhood friend. Beatrix Mizer was born in Ohio in a German-American family. They moved to Red Cloud, NE, in 1884. 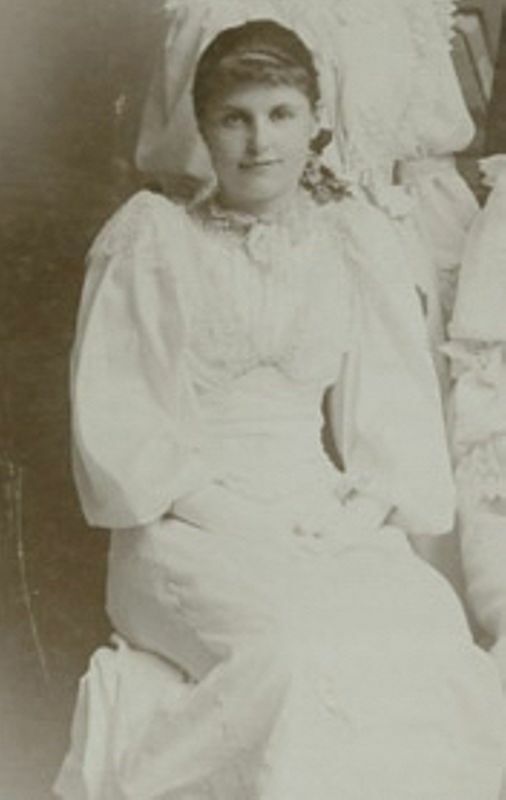 Cather later recalled that when she first enrolled in school in Red Cloud, “Trix Mizer was the prettiest little girl I had ever seen.” They acted together in an 1888 production of “Beauty and the Beast” at the Red Cloud Opera House. 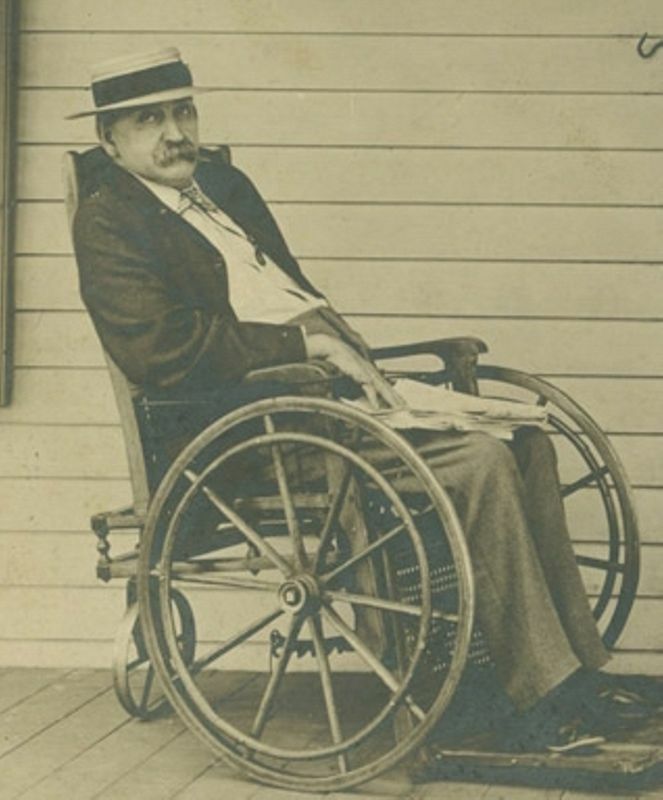 Mizer graduated from Red Cloud High School in 1893 and studied voice at the Chicago Conservatory of Music 1897-1898, qualifying as a music teacher, and at the Chicago College of Music 1899-1900. She married Sidney Florance in 1903. In 1909 the couple moved to Red Cloud, where they settled and raised a family. Beatrix’s Chicago musical studies and return to Red Cloud may have inspired elements of Cather’s novel Lucy Gayheart (1935). Cather’s correspondence with both Florances began as early as 1914 and extended through the 1940s. Emigh, Edwin C. (1875-after 1940) (“Eddie”). American dentist; Cather’s Red Cloud schoolmate. The Emigh family came from Illinois, where Edwin was born, to Red Cloud, NE, where he attended the Red Cloud schools. His father Jerome S. Emigh was a dentist, and he became one also, settling by 1920 in Grand Island, NE, to practice. He married Alice E. Remsburg, a music teacher, in 1906. Cather, writing of her first day of school in Red Cloud, remembered noticing how smitten Eddie Emigh was with pretty Trix Mizer. Bentley, Alec (1874-after 1940) (“Alex”). Farmer; Cather’s classmate. 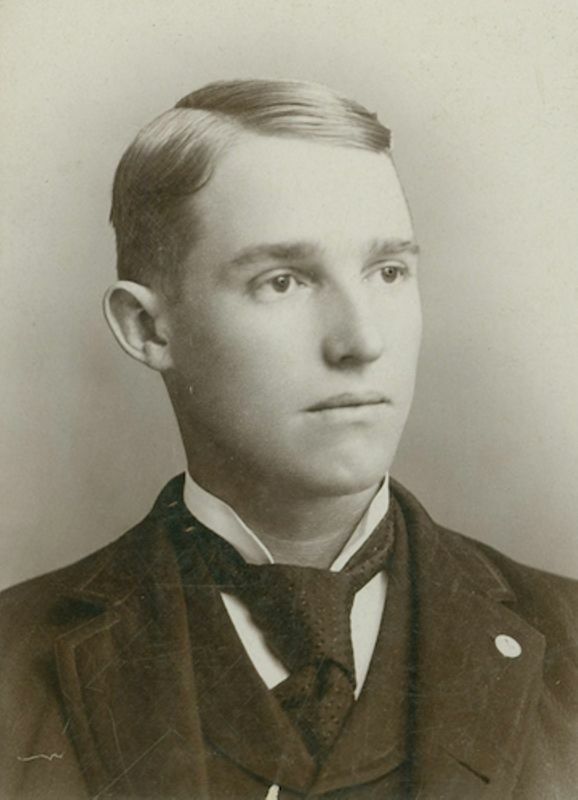 Born in Iowa, Alex Bentley and his family moved to Webster County, NE, in 1875. He and Cather were two of the three graduates of Red Cloud High School in 1890. When their principal, A.K. Goudy, moved to Lincoln to serve as state superintendent of education, he hired Bentley as a clerk. 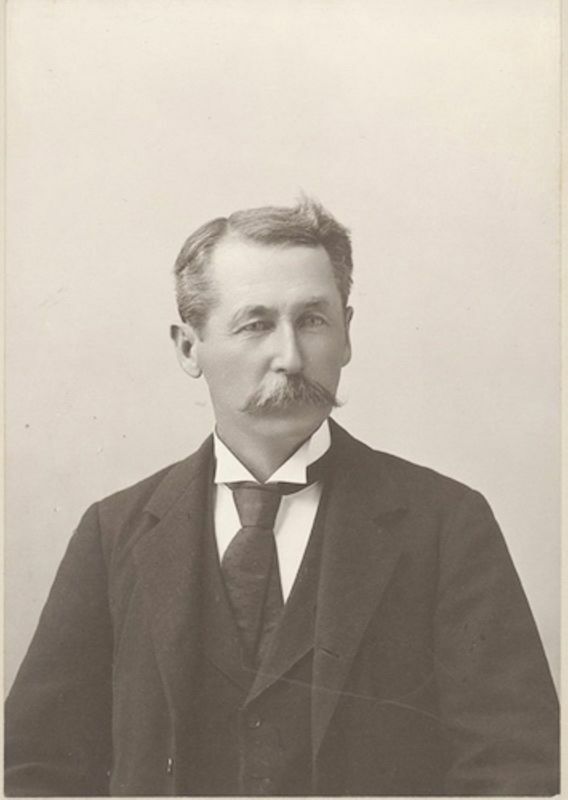 Bentley returned to Webster County after 1900, married, and farmed near Red Cloud. He moved to Missouri after 1935. Tulleys, John (1875-1935). American accountant. 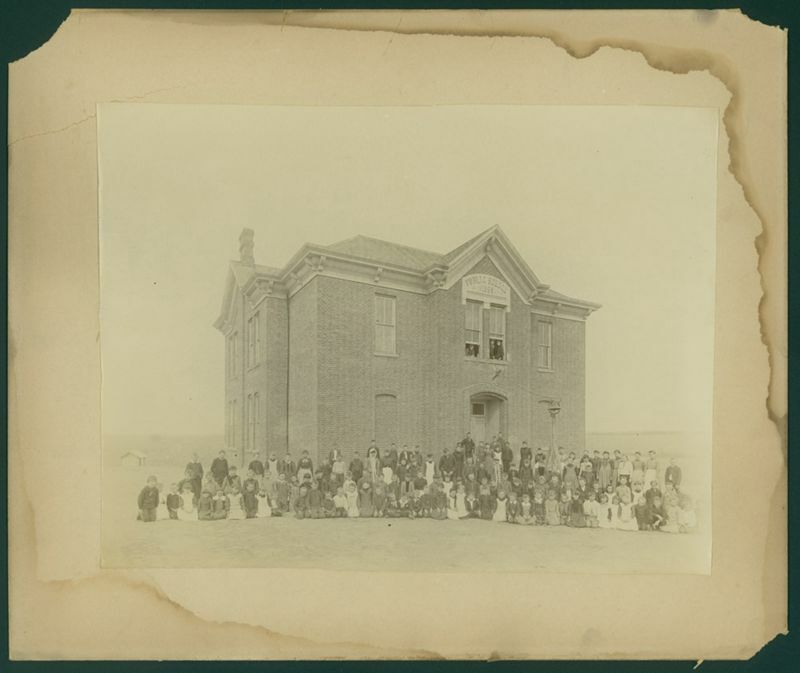 Born in Nebraska, the second son of James and Sophia Tulleys, John Tulleys was educated in the Red Cloud, NE, schools. With Cather and Alex Bentley, he was one of three 1890 graduates from the high school. He taught in local schools, then worked as a printer in Red Cloud and in Lead, SD, where he met Laura Marr, whom he married in 1904. 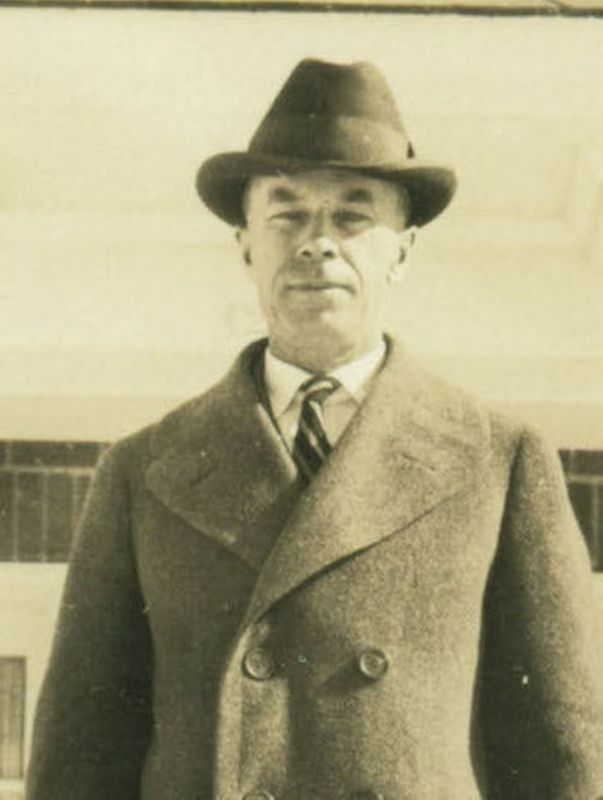 After working in the state auditor’s office in Lincoln, NE, he formed his own auditing firm in Lincoln, which he sold in the 1920s after legal difficulties; he moved to the West Coast and died in Seattle, WA. Cook, Henry (1849-1928). Red Cloud pharmacist and physician. Born in New York, Henry Cook married Arabella Meacham in 1874; three of their four children were born in New York. The family came to Red Cloud, NE, in 1880, where Henry set up his drug store on the east side of Webster Street. He later was licensed as a physician, although he continued to run the drug store. Cather worked for him while she was in her early teens, earning money for books and for wallpaper for her attic bedroom. 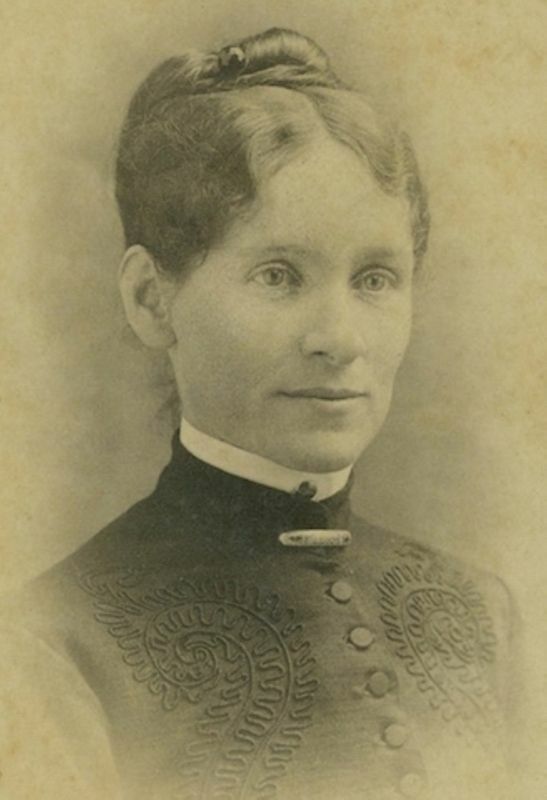 In 1889 she represented the Cook drug store in a merchants’ carnival by dressing as an alchemist in knee pants, and she remembered Dr. Cook as one of the friendly figures at her graduation. 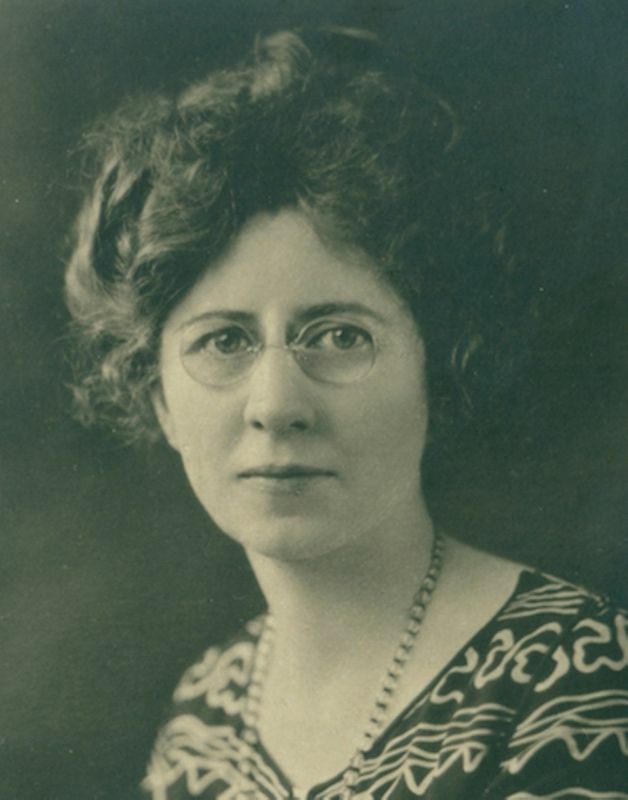 A generous man, Dr. Cook helped several young people get a start in life, as Cather says he helped her while she was at the University of Nebraska.